You are attempting to print premium content. Please subscribe to have access to this content. Add a bit of whimsy to your winter wardrobe with this fun bobble-filled scarf. Tunisian simple stitch (Tss): For each stitch of the forward pass, insert hook from right to left into next vert strand, yo and draw through a lp of yarn. Bobble: All in same st, [yo, insert hook into st as for Tks, yo and pull up a lp of yarn, yo, pull through 2 lps on hook] four times, yo, pull through 4 lps on hook, ch 1 to close bobble. Fabric is created on the bias and then seamed, making a circular scarf whose stitches gently sweep upward, highlighting the face. Note that in this pattern, the return pass is done differently than is usual in Tunisian crochet and that each forward pass begins by making a ch 1 and then working into the edge st. 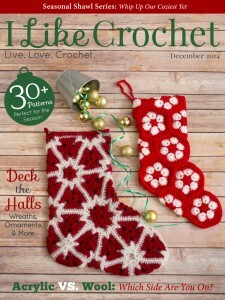 In this pattern, the first and last stitches of each row are referred to as edge stitches. Row 1: Forward pass: Ch 1, Tss in edge st and in each st across to opposite edge st; do not work edge st. [25 lps on hook] Return pass: [Yo and pull through 2 lps] across. Row 2: Forward pass: Ch 1, Tss in edge st and in next st, bobble in next st, Tss in next 18 st, bobble in next st, 1 Tss in each of the next 2 sts; do not work edge st. Return pass: [Yo and pull through 2 lps] across. Rows 3-5: Rep row 1. 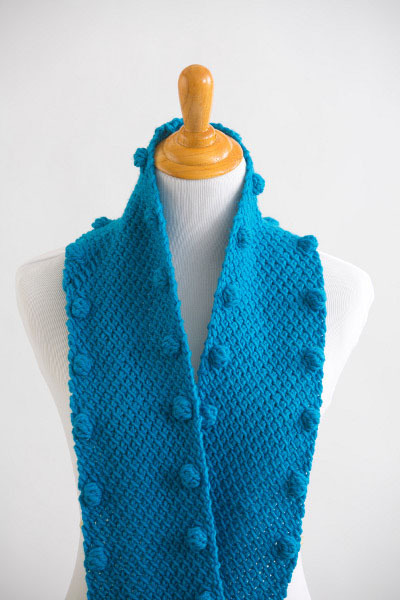 Rep rows 2-5 for pattern 21 more times or until scarf is as long as desired before seaming. Rep row 2 and 3 once more. Bind off in Tss: With smaller crochet hook, *insert hook from right to left behind next vert strand, yo and draw yarn through both st and lp on hook; rep from * to end of row, fasten off, leaving a long tail for seaming. Making a neat seam in Tunisian crochet can be tricky business. 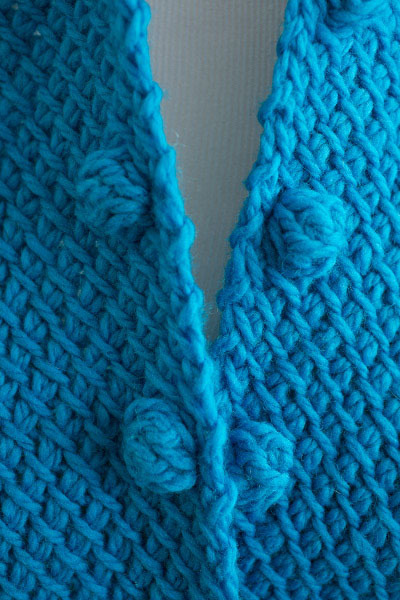 Try the following method, which mimics the yarn path of Tunisian simple stitch. Holding set-up row and bound-off row together with RS facing, insert threaded needle from back to front through edge st of set-up row and draw yarn through, insert needle beneath the chain on top of bind off to left of next unworked vert strand and pull yarn to the front, and then insert needle from left to right through unworked vert strand below bind off. *Return to set-up row and draw yarn from left to right through next unworked vert strand, draw yarn from back to front beneath next ch on top of bind off, draw yarn from right to left through next unworked vert strand; rep from * to edge st, draw yarn from front to back through edge st, draw yarn from left to right through last unworked vert strand of set-up row, draw yarn back through bound-off edge to fasten off. How do you get a yarnaholic to not buy so much yarn?